Don Pepi’s Pizzeria at Penn Station. Today’s letter was scrawled quickly as I rushed to write it on the back of my laptop before I hopped on my train back to Washington. My quick draft didn’t come out as elegantly as I had hoped. 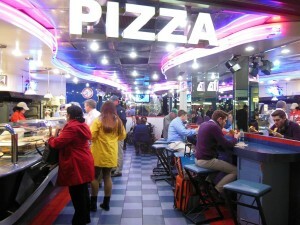 I left it on the counter at Don Pepi’s Pizzeria at Penn Station. I grew up watching the New York Mets on WWOR, I was a huge fan in the early 80s and was rewarded with a miraculous World Series victory in the fall of 1986. I could tell you any statistic about Dwight Gooden, Darryl Strawberry, Mookie Wilson or Gary Carter (RIP my friend!). Times have changed and so has my location. Living in our nation’s capital, I’ve become a strong fan of the Washington Nationals. In fact, I haven’t missed an opening day game since they moved the franchise to DC in 2005. This year didn’t end up the way we had hoped, but my old team, the New York Metropolitans are still in the race. So, here’s to them, LET’S GO METS! 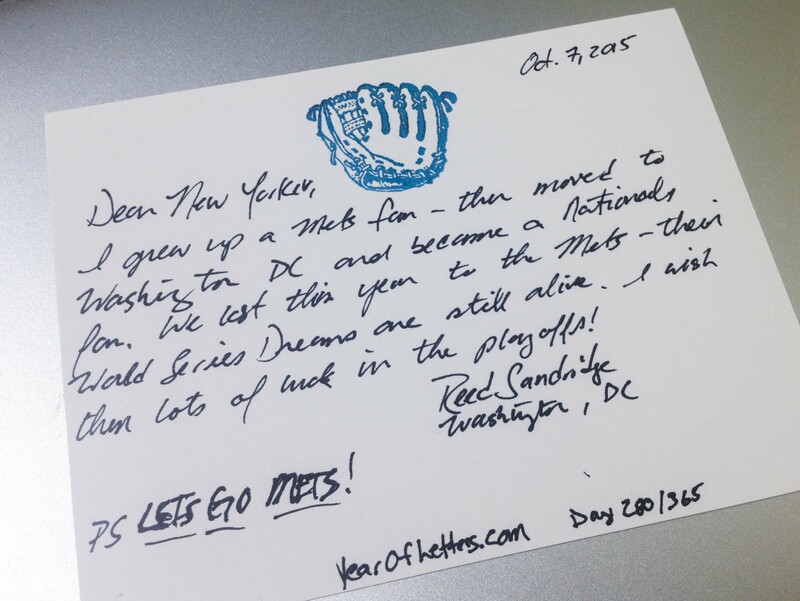 I grew up a Mets fan – then moved to Washington, DC and became a Nationals fan. We lost this year to the Mets – their World Series Dreams are still alive. I wish them lots of luck in the playoffs! This entry was posted in Anonymous and tagged baseball, handwriting, handwritten letters, letter-writing, letters, New York Mets, Paper Source, sports, stamps, Washington Nationals, Year of Letters. Bookmark the permalink.